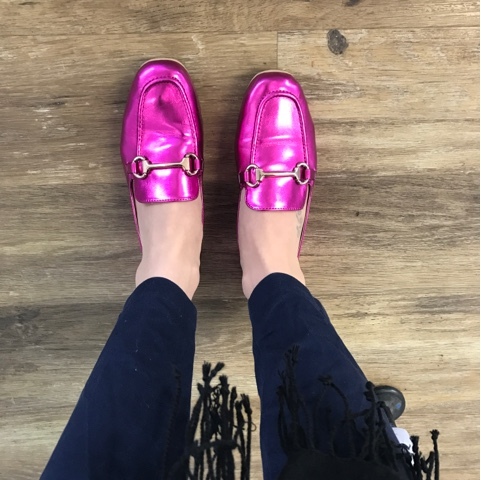 When I saw that Gucci had brought our their cult loafers in pink metallic I thought I'd died and gone to heaven. However, when I then saw the price tag I just died inside. I just couldn't justify spending that much money on something I knew I wouldn't get much wear out of. PLUS, being vegan I am trying to cut out buying real leather. So you can imagine how incredibly happy I was when I saw these beauties in Primark. Almost identical but at 50 times less of the price tag and cruelty free. I saw them a while back on their Instagram and couldn't find them anywhere in store so thought I'd sadly missed out but about a month ago I visited their Oxford Street store and there they were sitting pretty along with another 5 different colours. I must say, they are not the most comfortable and you definitely have to have plasters on hand when wearing them but they do look so cute. I bought them in a size 5 (I'm normally a 6 in Primark) and they fit perfectly. I'm going to go back and get them in white this weekend.. and possible navy!